They’re free fertilizer & mulch! Leaves can be used as mulch to suppress weeds and add nutrients to your soil. You can let them stay where they fall, or move them to a compost pile for later use in your flower or veggie beds. Pollinators love ‘em! Many species, including beneficial insects like pollinators, rely on fallen leaves for shelter and food during fall and winter months. This is just another way we can help them help us – after all, we owe a lot of what ends up on our plates to them. Reduce waste! Yard waste accounts for nearly 17% of our solid waste stream. Why not reduce the load and reuse fallen leaves as compost? 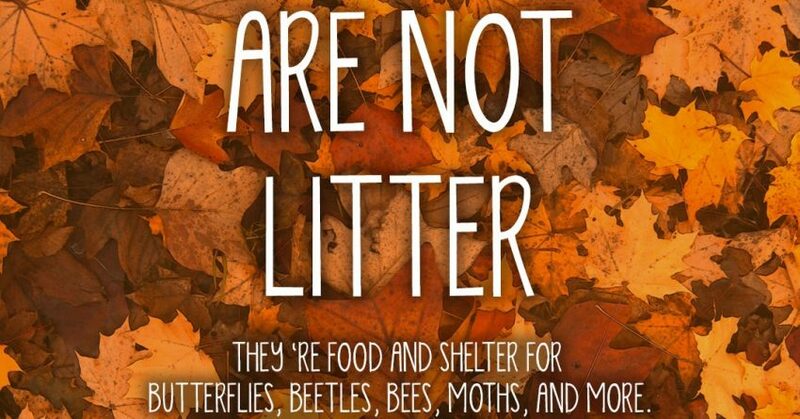 It’s not natural to rake! Raking removes nutrients from your yard that would otherwise feed the soil and make your grass even greener come spring. Nature’s cycle works – why break it? Save your time & energy! Sit back and enjoy the colors of fall. Time is precious – don’t waste it.